How have you been in the meantime? We have spent it finishing the feature we‘ve announced last time – photo backup. We already have a few first users helping us with the testing. While we‘re putting last touches to the photo feature, make sure that the rest of your phone data is backed up and secure on PhoneCopy.com. You can do that by synchronizing manually, but you can also set up auto-sync and let us take care of everything. That‘s what PhoneCopy is for. This month, we are also planning a switch to monthly Premium subscription plan. We have set the prices so that the cost of PhoneCopy stays the same, and those of you who don‘t have PhoneCopy Premium yet can try it out, even for only a month. You‘ll see that you will love our Premium service. Don‘t believe us? Simply try it! The payments will take place automatically, so you won’t have to worry about renewing your subscription. We hope that the monthly payments will allow even more people all around the world to discover PhoneCopy Premium. You can use PhoneCopy for easy contact transfer from your Gmail address book or other contact database in the vCard (.vcf) format. You can find the detailed guideline here. If you are using Mozilla Thunderbird as your email client and would like to import contacts from your phone, you can use LDIF format with this guideline. Did you know that you can invite your friends, family, colleagues or business partners to PhoneCopy Connect directly from your contact book? Welcome to a quick announcement regarding your PhoneCopy for iPhone and iPad application. Due to the changes in the new iOS platform, the auto-sync feature in PhoneCopy app has stopped working. We apologize for the inconvenience. As soon as we realized this, we fixed it and have already posted an update in the App Store! But to make it work the auto-sync needs to be set up again. You can do it by simple tap on "Set up auto-sync" on the main screen in the PhoneCopy app after you have logged in. If you would like more detailed instructions, take a look at our how to guide or watch the YouTube tutorial to see the setup step by step. Thank you for reading and have a geat day! PhoneCopy.com is cross-platform. In addition to providing a nifty, advanced web app, it supports close to 1500 different devices (including tablets, and Mac and PC computers). Until recently, iPhone and iPad users could sync into PhoneCopy only their contacts. That has now changed—with the release of a companion app, PCalendars, which opens syncing of calendar events to all users of iOS devices from iOS 4 upwards. Once are calendar events synchronized into PhoneCopy.com, not only are they accessible in the web app—they can be synced to any other device for which PhoneCopy supports calendar synchronization. This includes many Symbian smartphones and advanced feature phones, such as Nokias and Sony Ericssons. Syncing of calendar events between PhoneCopy.com and Google Calendar is also possible. We hope you’ll like our new addition to available syncing options. If so, please be sure to vote for it in iTunes. Your feedback is welcome: please use support contact within the application. It happens commonly: a Mac user gets a new iPhone and would like to fill it with contacts already on his Mac. That should be possible through iTunes, but users often find themselves unable to set the transfer up. This is when PhoneCopy applications come to the rescue: one for your Mac, and one for your new iPhone. Use the one for Mac first, to sync your contacts into PhoneCopy.com; then set up PhoneCopy app on your iPhone, and transfer your contacts from PhoneCopy.com to your iPhone. Apple now also provides iCloud, for which one needs a Mac OS X Lion (from update 10.7.2 upwards), and iOS 5 on iOS devices. PhoneCopy applications do not have these limitations: PhoneCopy for Mac runs on Mac OS X from version 10.5 (Leopard) upwards. If you’re sticking with, say, Snow Leopard for some more time, we don’t mind; and PhoneCopy for iPhone can be installed on any iOS device (including iPads and iPods) from iOS 3.0 upwards. Even if you do have Lion, you may find that PhoneCopy provides some nifty, handy control over your contacts: such as detailed history of changes you made to the contacts, with option to revert any one change—available in our web app at PhoneCopy.com; or a special folder that keeps everything you ever deleted, just in case you should need to restore that one contact deleted by mistake—also available within your account at PhoneCopy.com. Should anything go wrong with your contacts on your iPhone, iPad, or on your Mac, PhoneCopy.com will keep your contacts safe. It was close to the very end of the last year when we could announce passing an important milestone: 100,000 registered users of PhoneCopy.com. Last night, the count just went above 110,000. That is an increase by full 10 percent in a mere month! We are very excited about this growth. It is thanks to all of you who like PhoneCopy, who find it an indispensable service, and who do not hesitate to recommend this phone data management solution to your friends, family, colleagues, and to just about every one who values his contacts and possibly other phone content. Also, we are not far from reaching 150,000 synchronized devices; we expect to pass that figure in about a week. Furthermore, we are close to having confirmed 1400 various devices as working with PhoneCopy. What if you lose your phone? Do you ever dread what it would be like to suddenly not have your phone? Surely, smartphones cost money. But what do your data cost? Especially your contacts? Would any money buy them back? Relax. There is a solution: PhoneCopy.com. Once you have synchronized your contacts (and possibly other phone data, depending on what your phone can do) into your account at PhoneCopy.com, you can rest easy—they are safe there. Even if you later do something stupid on your phone, like deleting or editing something by mistake, you will always be able to find it in your PhoneCopy account—if it was the kind of data that you had synchronized. 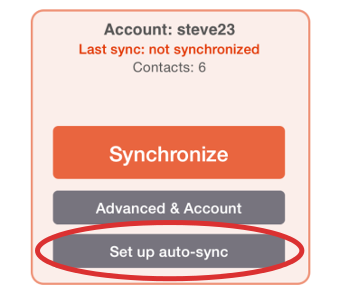 One of the strengths of PhoneCopy is that it keeps track of the changes you made to your contacts in-between synchronizations. The technical people like to call this a “history of changes”. Should you realize that a change you made was in error, PhoneCopy allows you to revert that change—to go back to any previously synchronized version of the contact. Synchronize to PhoneCopy, and you will never lose your data again.